Is this the end of Olympus DSLRs? Will the OM-D be the death of Olympus Four Thirds cameras? Does the Olympus OM-D signify the death of the Olympus SLR? 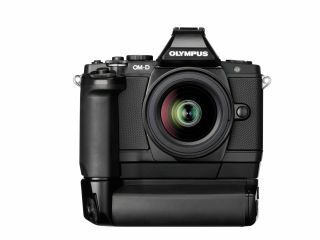 The announcement of the Olympus OM-D will bring joy to fans of the old OM-series film SLRs, which were ground-breaking in their day for their compactness, technical sophistication and design. But the announcement had a sting in its tail. The OM-D is not a DSLR. It's a compact system camera (CSC) in a DSLR's body, and the viewfinder is the electronic sort rather than optical. Ask any SLR fan - even the best of today's EVFs lack the clarity and immediacy of an optical 'finder. So does the OM-D finally spell the end for Olympus's digital SLRs? Mark Thackara, Olympus UK's national marketing manager, won't be drawn: "They [Olympus] haven't ruled out the possibility of a new Four Thirds camera. We know there is a vocal community who would like to see another body in the Four Thirds format, so we will have to wait and see." The facts, however, speak for themselves. The company's last DSLR was the pro-spec Olympus E-5, back in 2010, and you have to go back nearly three years, to February/March 2009 for the two before that (the Olympus E-450 and E-620). So are compact system cameras really the way forward? Were Olympus's DSLRs really so bad? Presumably, if enough had been sold they'd still be with us. But it didn't help that endless carping over sensor sizes and pixel counts, mostly from those who'd never picked one up and used it, mean that Olympus DSLRs were often seen as the poor relation to APS-C format cameras. This was the point; you did actually have to use them. The Olympus E-series DSLRs had a tight, light, precise feel that rival SLRs lacked then and still lack now. They were a lot better in this respect than, dare we say it, Olympus's current PEN-series cameras. Take the Olympus E-400, which eventually evolved into the E-450. It had a body barely larger than a DSLR-style compact system camera, but Olympus never upgraded its primitive 10-megapixel Live MOS sensor to the later and much better 12-megapixel version. And if the E-400 was still around now, and was fitted with the brand new 16-megapixel sensor used in the OM-D - well, would we really need the OM-D? Olympus would be able to revive its iconic OM brand with a camera which was spiritually and physically much closer to the original. Instead, what Olympus has launched may well prove to be an excellent camera, but it's pretending to be a DSLR when it isn't. It's a digital replica of the OM rather than a reincarnation. The CSC format does have advantages. The removal of the mirror allows straightforward, fast and effective live view operation, always a difficulty for DSLRs. It means that even though the OM-D E-M5 is as broad and as tall as the old E-400, it's a lot less thick in the body. And the electronic viewfinder can display exactly the same information as the LCD display. There are technical innovations too, like the swivelling, touch-screen display, 5-axis sensor-shift anti-shake system and FAST (Frequency Acceleration Sensor Technology) autofocus. The OM-D E-M5 is probably going to be a very good camera, but it's not a DSLR. And will it really match the lightness, precision and feel of the DSLR cameras that Olympus used to make? Maybe, like the song says, you don't know what you've got till it's gone?